I will plant hoof prints on your soul." Oh, that quote inspires such a lovely "butterflies and rainbows" sentiment regarding horses and their effect on our hearts and minds. In a considerable part of the riding population this quote certainly holds true. Being accepted into mindful relationship of mutual awareness and respect with a horse, can enrich our lives (and hopefully our horse's life too) so extensively that we cannot imagine who we would be without them. However, for a growing number of the riding population, fear and anxiety tarnishes the experience of this relationship. Today, I'd like to talk about reintroducing canter confidently. This is for riders who know how to canter, have previously done so with reasonable proficiency, and for some reason or another have experienced a loss of confidence at that gait. Firstly, consider your horse? Are you suitably matched in skills, ability and confidence levels? Is your horse communicating soreness, or maybe boredom through their body language and behaviour? Are you engaging your horse's mind or do you only ride your horse in the arena or round yard - this may account for some potential behavioural issues. Do you only experience confidence issues at canter on your horse, or is it all horses? If your answers to all of these questions are that your horse is suitable, we can get down to the business of you experiencing confident canter again! Utilise a visualisation technique such the Circle of Confidence, strongly established prior to riding, will certainly benefit you when you are riding and wanting to increase your horse's gait. The next step will be to utilise your out breath. I have created a short video on how to do this, as I have mainly talked about this in presentations and want the demonstration easy to find! You can do this prior to mounting, while riding and especially prior to and during cantering. Take your time to feel really comfortable. It's important that rather than trying to bury our anxious feelings, we become curious about them and welcome the experience. Yes, I did just say welcome the experience! The Paradoxical Theory of Change says that we must fully experience something to move through it. So, it's time to embrace and own any riding anxiety you may experience so that we can finally TRANSFORM this! Break down the process into small manageable chunks. What I mean by this, is that rather than going for a canter, set your self a manageable goal of two established canter strides before coming back to a walk. Then if all went well, try it again with say 5 canter strides before coming back to walk or trot. Slowly increase this as your confidence improves. 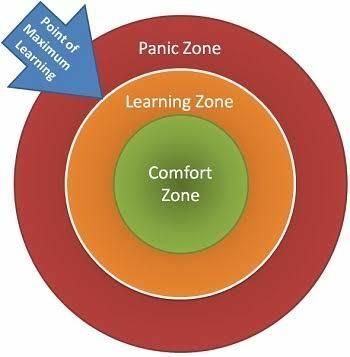 Remember to consider your Learning Zone and maximum point of learning. If you have forgotten what this is, please refer to an earlier blog of mine linked to this article. 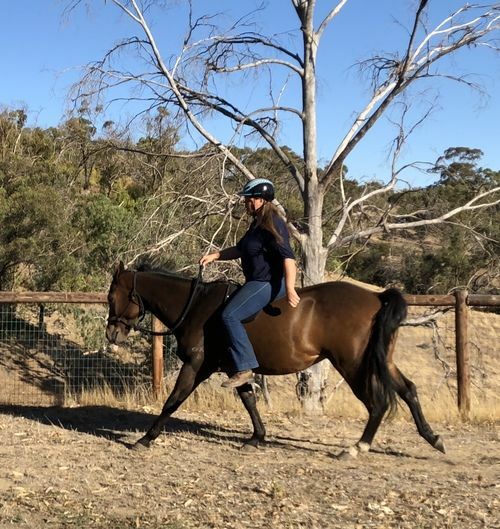 Ideally, if you have access and your horse is comfortable out on the trail; I prefer to reintroduce confident canter on a steep uphill rather than in an arena. Balance is less likely to be an issue then, but it really is up to what suits your situation. Oh, and finally (and I cannot stress this enough) - please, please, please if you are riding with someone else, only ride with someone who you feel safe with and who will go to YOUR pace not theirs. If you would like to discuss further, please send me an email or FB message. I'd love to hear how you go!